NEW YORK, NY--(Marketwired - Mar 17, 2016) - Baldwin® Hardware, a leading brand of the Hardware & Home Improvement (HHI) division of Spectrum Brands, Inc. (NYSE: SPB), today unveiled new additions to its Reserve collection, including the La Jolla and Santa Cruz handlesets. Additionally, other new items include a crystal knob and a contemporary knob; both of which will include a new push-button privacy feature to enhance egress functionality, which is also now available on all Reserve knobs and levers. Reserve also introduced a new polished nickel finish to all contemporary and traditional products in the line. All new products will be on display at the 2016 Architectural Digest Design Show booth number 293. Baldwin Reserve is known for offering distinctive designs with both style and substance and draws upon Baldwin's 70-year heritage of quality and craftsmanship. "Reserve opens the door to a world of customizable inspiration," said PJ Rosch, brand manager for Baldwin Hardware, Spectrum Brands, Inc. - Hardware and Home Improvement Division. "These new offerings build upon the gorgeous array of products our customers have enjoyed for 70 years. The new polished nickel finish adds a new opportunity to really work within the contemporary design space." Baldwin also launched a playful social-media campaign encouraging show attendees to snap pictures of its new products in booth #293 and pose with the Baldwin Couture models as they walk the show floor. By sharing and hashtagging with #70YearsBold and #BaldwinDoorCouture, participants can win one of many $70 Visa gift cards. Baldwin will be giving away a total of $30,000 in Baldwin hardware and nearly $3,000 in gift cards to participants, all to celebration our 70 Year Anniversary. Baldwin is 70 Years Bold! To learn more, check out Baldwin's social media channels on Facebook, Twitter and Instagram. All Reserve traditional and contemporary products will be available in the new polished nickel finish, which is meticulously crafted from brass, and coated with an ultra-hard lacquer making it extremely durable and resistant to the effects of wear and tear. The La Jolla handleset features a minimalistic design with clean lines and crisp straight edges for a contemporary look. Santa Cruz also plays to a contemporary audience with a long profile and smooth lines. The new crystal knob brings brilliant clarity with light-catching crystal, while the contemporary knob features a round shape contrasted with flat edges. In addition to unveiling the new Reserve products, Baldwin is delighting show goers by bringing 70 years of design heritage to life. Models adorned with headpieces and gowns inspired by Baldwin hardware bring new meaning to the term "door couture." "Many people like to say that 'hardware is like jewelry for the door,'" added Rosch. "We prefer to think of Baldwin as a fashion statement for the home; part of your design aesthetic. Baldwin is couture for the door." Baldwin is capturing all of the excitement of its 70th anniversary year at http://70yearsbold.baldwinhardware.com/ where people can learn about upcoming events, view pictures and videos, and stay up to date with the Baldwin blog. 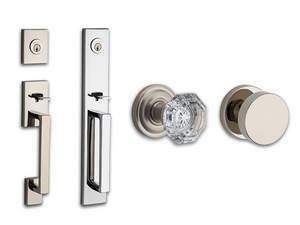 To learn more about Baldwin and its portfolio of styles and finishes, please visit http://www.baldwinhardware.com. HHI is a division of Spectrum Brands Holdings, Inc. (NYSE: SPB). Spectrum Brands is a global, diversified consumer products company and a leading supplier of consumer batteries, residential locksets, residential builders' hardware and faucets, shaving and grooming products, personal care products, small household appliances, specialty pet supplies, lawn and garden and home pest control products, and personal insect repellents. Spectrum Brands employs over 15,500 employees worldwide and sells to the top 25 global retailers with products in more than one million stores.